The year, 2006 became an evidence of fresh breezes coming into the premises of the college. With an objective of preparing young management professionals to fulfill the demand of emerging economy, the college opened a three year full time, under graduate management programme; ‘BBA-with specialization in International Business’ in 2006, under the permanent affiliation with, IMS, University of Lucknow. The dept. ‘BBA-IB’, Centre for Management Studies and Foreign Languages’ also pioneered for the entrance of female students after a very long time in this prestigious college of the town. This was the restart of co-education era and by today, about 4600 girls are part of this college. Prof. S.D. Sharma, principal of the college, Dr. A.K. Awasthi, dept. of Applied Economics, faculty of Commerce, Dr. Salil Chandra, dept. and faculty Commerce, were among the founders team of the dept. Dr. Saman Khan, and Mr. Anchal Dwivedi had glory to teach and guide its first batch of sixty students in 2006. Mr. Alok Nath Upadhyay (2007-07) and further in 2008, Mr. Vijay Raj Srivastava, Mr. Santosh Bharti, and Mr. Ashish Awasthi Joined as faculty. Dr. Shweta Mishra, Mrs Meenu Arora, Ms Vibha Tripathi were the faculties in mid of the duration. Presently, Dr. A.K. Awasthi, Coordinator, Dr. Saman Khan, in-Charge, Mr. Vijay Raj Srivastava, Ms. Shivangee Sharma, Mr. Sharad Kumar Chaturvedi and Mrs. Shikha Agrawal are the part of core team as the faculty of the dept. The department has successfully completed its 12 years in 2018. In a very short span of time, the dept. has carved a niche in the field of management education by providing ten batches of sincere, responsible and skilled professionals to the society till the date. From BBA-IB, many of the students have now been placed in various multinational and national companies in last few years. A full fledged placement and training cell has been providing ample opportunities to the students since the inception of the programme. The department is also running a three month certificate add-on-programme in Foreign languages say French, German and Russian since 2014. The department has regularly made efforts to improve and support its pedagogy by organizing 06 National Seminars, 02 Faculty Development Programmes, a number of Students Capacity Building workshops and Symposiums, ‘Parent- Faculty’ meeting, three industrial visits to Goa and Chennai sea ports, visits of reputed export houses and leading public and private sectors industries. The students had participation on regular note in institutes like, IIM, IIT, IBS, ICFAI-University, AIMA-LMA, TOI, and many other all over the nation. 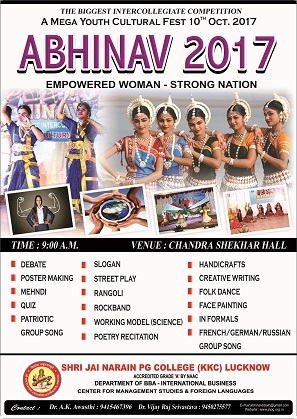 The department has made efforts to enrich its students by providing them opportunity to participate, coordinate and manage the annual co-curricular programs like, Abhyudaya the annual function, ‘Abhinav’, a prestigious intercollegiate mega youth cultural fest, ‘Abhigyaan’, the welcome of first semester interns, ‘Abhyutthaan,’ the farewell of final semester students, Induction Meeting, Saturday events comprising, management games and quiz, presentations and creative expressions. Apart from these the students are sent to summer training in their second year. The department has glory to listen inspiring and educating words from the prominent visitors of the department like, Dr. Lord Khalid Hameed, High Sheriff of Greater London, Prof. Ravi Behar, V.C. Azim Prem Ji University, Prof. R.C. Sobti, V.C. BBAU, Lucknow, Prof. R.K. Khandal, V.C., UPTU, Prof, J.V. Vaishampayan, V.C. Kanpur University, Dr. Reeta Bahuguna Joshi, Hon’ble Minister, Tourism, UP, Dr. Swati Singh, Hon’ble Minister, Food Control and Agri Export, UP, Mr. Srijan Pal Singh, Ex. OSD to Dr. A.P.J. Abdul Kalam (Ex. President of India), Prof. Shyamal Gupta, Director, SRMS, International Business School, Mr. Deepak Bhandari, CEO, Indore Color Organics, Sri R.K. Singh, Addl. Commissioner, Export Promotion Bureau, Uttar Pradesh, Dr. Veerendra Yagnik, House Chancellor of RVG, Educational Foundation, Mumbai, Prof. N.L. Sharma, Ex. Dean Faculty of Commerce, MJP Rohilkhand University, Bareily, Prof. J.K. Sharma, H.O.D, LUMBA, Prof. Sanjay Medhavi, Ex. HOD, LUMBA, Dr. Anupam Agrawal, Director, MBA, KNMIT, Sultanpur, Prof. D.K. Pandya, Dr. B.R. Ambedkar, college, Delhi University, Sri Sudhir Sinha, CEO, UPMA, Ms. Madhu Joshi, special secretary, higher education, Uttar Pradesh, Mr. G.S. Rawat, DGM, SBI, Mr. S. S. Rathore, Director, IEDI, UP, Mr. Kumar Keshav, MD, Lucknow Metro, Mr. Ravindra Kumar, MD, Moraceae Pharmaceuticals (P) Ltd. Mr. Rakesh Mittal, Founder Kabir Shanti Mission, Mr. Manish Uppal R.M. SBI, Prof, R.K .Tripathi, Prof. H.K. Singh and many more prestigious guests from academic and corporate field.